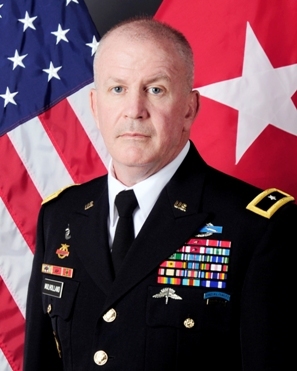 Brigadier General (retired) Sean Mulholland was a career U.S. Army officer with numerous tours and assignments with the Special Forces and throughout special operations. He commanded from the ODA to SOC level within the special operations community. His last command was with Special Operations Command South (SOCSOUTH) in Florida. He had previously commanded the 7th Special Forces Group. His personal decorations include the Defense Superior Service Medal, Legion of Merit (2), Bronze Star, Defense Meritorious Service Medal (2), Meritorious Service Medal (5), Joint Service Commendation Medal, Army Commendation Medal (2), Joint Service Achievement Medal, Army Achievement Medal, Combat Infantryman Badge, Expert Infantryman Badge, Master Parachutist Badge, Military Free Fall Parachutist Badge, Ranger Tab, Special Forces Tab, and various campaign ribbons. Sean Mulholland served his country in many ways, he was a strong believer in giving back to the community and was passionate about helping veterans. He took his military expertise and his love for people to the civilian sector by becoming the Chief Operating Officer of Southern CC, Inc., a non-profit organization which builds self-sufficient communities for veterans. With Southern CC, Sean worked directly with veterans and volunteers. Always doing what was needed, he picked up a hammer and nail to assist with the construction of the Capt. Andrew Pedersen-Keel Home that honors a 3SFG soldier who was killed in action in 2013.